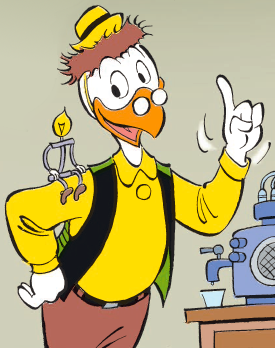 Gyro Gearloose is a Walt Disney character who epitomizes creativity. His inventions are always unexpected and usually trigger Donald Duck's short, explosive temper. Gyro's creations often don't work quite right, but that does not stop him. He keeps thinking, trying, tinkering and producing the most foolish, amazing, striking ideas. Gyro's character is a bit peculiar, with Little Helper his assistant, a robot that looks like a light bulb. He is a relentless, crazy, fearless thinker with his assistant; he is also a doer, a bit detached from the reality of this world, always good-natured toward others. Creativity is broadly defined as the act of generating or recognizing ideas, alternatives, or possibilities, and turning them into reality. It applies to many facets of our lives - such as the arts - painting, sculpture, dance, writing, film and theatre. Creativity is also an important quality in business, most obviously in the development of new products and services, but also in how we finance our development, sell and market, write and negotiate our agreements. We need it to attract, reward and motivate talent, and to grow our organizations. Like Donald Duck, dealing with the nutty, excitable Gyro Gearloose in your own company can seem daunting and difficult. When you embrace the need for creative thinkers, however, and recognize that there are many different expressions of creativity, you instantly recognize their value. With the GRI, we have the privilege of working with organizations regarded as the most creative in their industries. What does the GRI say about creativity and the Gyro Gearloose and Little Helper inside us? What can our organizations do to maximize creativity and its output? Here are four areas we identified where leaders can improve their company's creativity. There are as many ways of being creative as there are individuals. Disruptive, radical, risky ways on one end of the spectrum contrasts with other forms of creativity characterized by amazing refinements and improvements on the other. Understanding our unique best way of expressing creativity is the starting point for progress. Finding and valuing it, is no small affair. From our observations with the GRI, it's too often the privilege of just a few individuals. Following our own best way, with the type of motivation that comes with it, we are more likely to experience contentment, productivity and engagement and to nurture our unique form of creativity. Researchers refer to this motivation as intrinsic. With the GRI, intrinsic motivation shows in our Natural profile. The opposite also applies: being on a path forced on us with a lack of support will be demotivating and disengaging. It will hinder creativity. This motivation, often perceived as conflicting with our intrinsic motivation, is considered extrinsic. With the GRI, it is seen through the perceived adaptation and engagement level measured in the Role profile. In short, maximizing intrinsic motivation and optimizing the extrinsic ones - if or when needed – will stimulate creativity. As we build our understanding of what creativity means for us, we need to remember that others may have a different understanding and yet they are an integral part of a bigger picture of creativity and what it brings to our organizations. It requires knowledge and discipline to value everyone's unique way of expressing themselves. In the GRI world, it also means valid measurement and learning about it. An absence of that discipline to learn and understand how others contribute causes frustration, reduces interest and motivation, and ultimately hampers creativity. Valuing creativity means being open to appreciation, communication and attitudes that are disconnected from our own experience, or cultural ways of looking at the issues. Acceptance, humility, forgiveness, and openness help with this process. In the world of creativity, a senseless, preposterous idea is capable of triggering new amazing ideas, fresh viewpoints and innovation. What seems to be a stupid idea can turn out to be outstanding. Throwing 100 ideas out to solve a problem, no matter what perspectives these ideas are coming from, instead of just one, or ten, should be the norm. In our organizations, the best creative ideas do not come from only one person like Gyro Gearloose, but from many others who are part of, or even outside of the organization. Smart minds and "gear-loose" people borrow and build on others' ideas. They accept having their own mindset challenged, or keeping it loose for further thinking. Creativity is a process that continuously needs to remain open to new ideas and additional input; the most absurd suggestions from individuals who seem to be the most ludicrous, often turn out to be the most precious. Valuing individual differences and contributions, encouragement and openness to express and try new ideas must be ingrained into a company's culture. Creativity is an iterative, persistent process not a one time event. As often is the case with the people or behavior aspects of a company's culture, creativity starts at the top. Leaders need to allow creativity to channeled throughout the organization. In this Internet age where being distracted is the norm, being focused is a precious asset, so find ways to give employees' opportunities to focus. Time is also an essential factor of the challenge for creativity: to be able to emerge in time, before being timely executed. When acquiring new teams from outside, a culture of creativity will help reduce the high emotional costs typically associated with the acquisition, and enhance the benefits of a new diversity. Whether coming from outside or inside, creativity properly understood and implemented provides the fuel for a company's sustainability and growth. The Albert Einsteins and Steve Jobs of our time, and all of us, have something of a Gyro Gearloose and Little Helper in our minds, hearts and hands. Thinking creatively and expressing our own character, are equally important to consider. What we mean by character in this context is the behavior, drive and motivation of how creativity will be expressed. This is captured with the GRI Profile, and referred to as the “How” component of our personality. Since there are so many ways for expressing both, everyone gets a chance to be creative in their own way. The “Character” or “How” components are harder to capture, so organizations that want to foster creativity must pay particular attention here. The GRI helps to bring a deeper understanding of how people function, how they derive intrinsic and extrinsic motivation, and from there, how to build a company culture that develops and rewards people’s creativity. Being capable of bringing both smart thinking and character into perspective contribute to what makes Silicon Valley a great place for entrepreneurs. Both are key for imagining and implementing creative solutions in our businesses. GRI Profiles inform about our unique way to perform ... and be creative. The three profiles below are examples of individuals who have demonstrated creativity far beyond average in their industry. Here is a snapshot of what the GRI Natural profile say about them. The profiles are a visual symbolic representation of their unique way to perform, from which the texts are derived. A radical creativity, with no fear of the unexpected. Takes time to think ahead. Keeps authority to push forward new ideas consistently over time, including on those who will resist to the change. Does not appreciate public speaking but gets it done with others who naturally better handle it in the team. A brilliant approach to problem solving who went through all the sophistications of a new go-to-market approach that became highly successful in the industry. Humble, amiable, unpretentious, very accessible. Others in the company executed from the amazing strategy put forward. Brought new ideas to the market by an above nature capability to network and connect with other brilliant minds, ideas and projects that are continuously emerging in the industry. Complexity and details of the execution are brought to fruition by the team, lead by this intrepid and charismatic communicator.